Last night, there was a downpour for about an hour around 9pm. Fortunately, it wasn’t windy, but it was cold out and it sounded like ice pellets at times. My tent was doing well except for the mist that flies in at random moments like it’s always done where the mesh is. The problem I noticed was that the tent pad I was camped on was not very absorbent (rocks/mud) and puddles developed. A large one was at the foot of my tent and I could see the water rising up against the bathtub floor of my tent. I worried it might leak through and thought about getting out to dig a trench and divert the water. Then I noticed that I didn’t have a pole to dig with because they were holding up my tent. I decided to stay warm and dry and figured it would just pool at the bottom if it did seep through somehow. I just moved everything from the foot of the tent and let it be. In the morning, all was good, except that when I rolled up my sleeping pad, there was a layer of water between the floor and my sleeping pad. I don’t use a ground cloth and figure it was just the combo of the saturated ground and pressure of my pad that made it seep in. E has a separate pole for the back of her tent, so I found out this morning that she did get out dig a trench to divert the water and her tent faired well with a groundsheet. We both slept in an were coincidentally ready to hike out at 7am. It was in the upper 30sF/3.3C and snow dusted the peaks around us from last night’s rain. We hiked together for an hour or so before I cruised on down a long downhill. 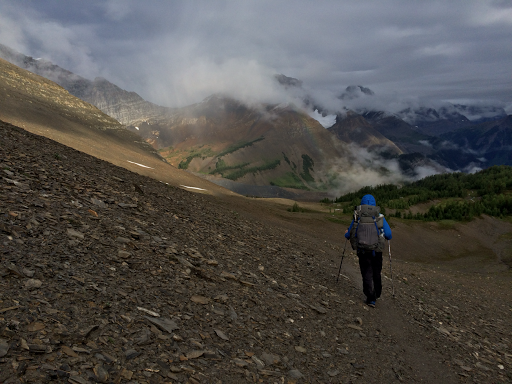 Before that, we had a climb up to Numa Pass and the morning views were great! 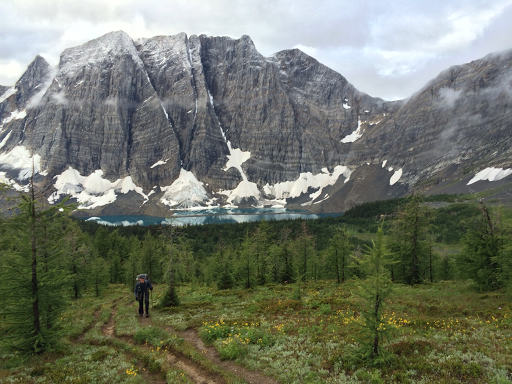 We could look back and see where we camped at Floe Lake. We also got our first look at what is called the Rockwall. We pretty much follow the sheer cliffside today and some of tomorrow. We rounded a corner and the sun was attempting to break through and there was a little bit of a rainbow. It showed up clearer in person, but you can slightly see it above my head and to the left a bit. I just loved the scene this morning with the lifting clouds. 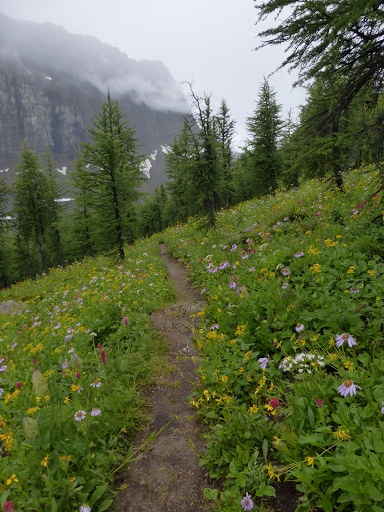 The Rockwall trail that we are overlapping is a very popular route with a small window of time to hike it snow free. 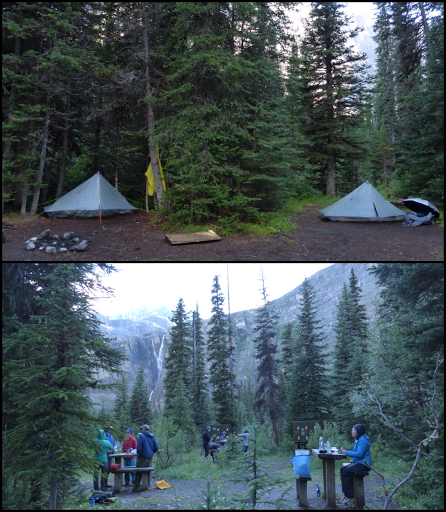 Campsite reservations can be difficult to get and there are many other hikers going both directions. Our mileage this leg is controlled by the campsites and it’s been nice to have some lower mileage days to finish early and sleep in a bit. Tomorrow is a big day, so my body better not get too used to the relaxed miles. After we split on the downhill this morning, we hiked apart the rest of the day. 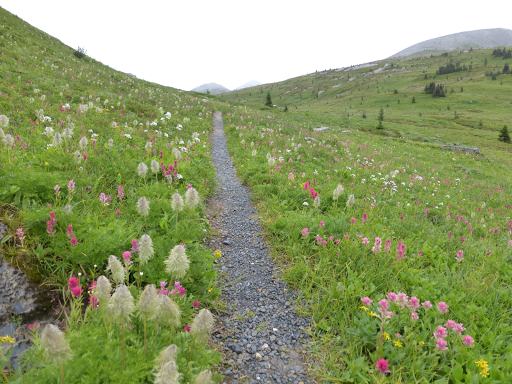 It is a shorter day than yesterday, but has slower hiking with more overgrowth and long ups and downs. 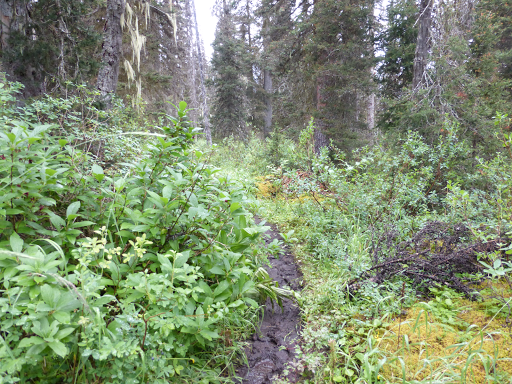 On long dip between Numa and Tumbling Pass, there was a lot of wet overgrown brush to hike through. It was two hours of it and with temps barely at 40F/4.4C, it chilled me quite a bit. I looked like I had been swimming in my rain gear with how wet it was. 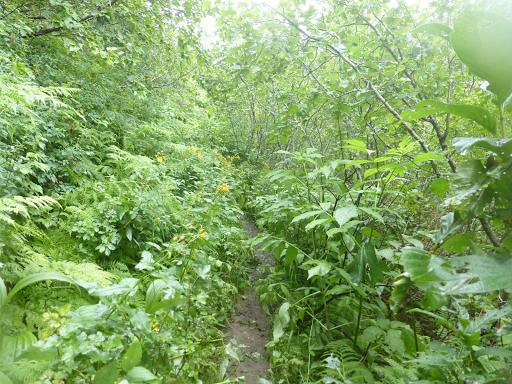 The aspect of hiking thorough cold wet brush has to be my least favorite part of the GDT! It is really quite a challenge for me to be in brush to begin with, but combining that with a cold car wash effect makes it even more uncomfortable. It isn’t just a little bit of water. These plants hold so much that you may as well dump a bucket on yourself. Even with the rain gear, it’s cold. Add to it that it was a 3mi/5km steep climb up to Tumbling Pass and that means you’re also sweating in rain gear…while it’s 40F/4.4C. Once I got to the top and leveled out, it hit me that I was just wet and now quite cold. There was very little standing still today. I just had to keep moving to stay warm. I never bounced back from it all day today and am just chilled to the core. My body just doesn’t have the insulation and furnace to get warm again once I get cold. 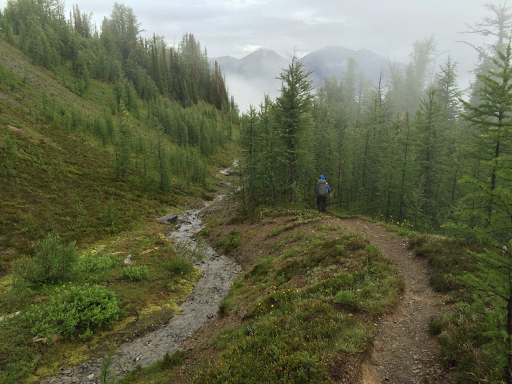 Definitely the biggest challenge for me on this trail is the back to back to back days of being wet and cold. Not looking forward to the third morning in a row of putting on those wet shoes and socks. I haven’t mentioned that it drizzled and rained on and off all day too. We’ve been lucky and even today, it was clear enough to still get the views thankfully. Here’s one up close to show how closely the trial follows the Rockwall and a pano to give the full perspective of how large it is. After Tumbling Pass, it was back down into dense forest to Tumbling Creek Campground before it headed up to Wolverine and Rockwall Pass. 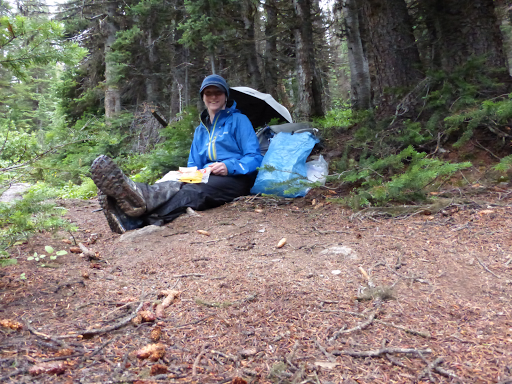 It was raining steadily and I was beginning to think it was going to be a no lunch, all snack bars, kind of day when I came across an awesome dry spot under a tree in pine needles that wasn’t muddy. Jackpot! I sat down and ate quick so I didn’t get too cold. It was a rushed lunch, but I felt a lot better once I ate and the rain let up. To distract myself from the discomfort of today, I listened to a lot of the Navigating Early audiobook and enjoy it. I can think of many kids that would enjoy it and it has many quality life lessons woven in there. A nice adventurous story with heart. 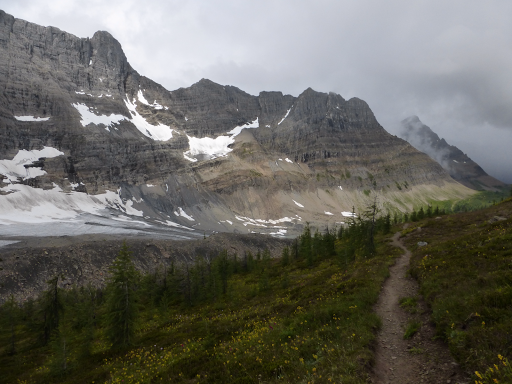 The best part of the day was Wolverine and Rockwall Pass. Wide open relaxed hiking with great scenery. The rain even let up as I got to the end. Just a wonderful stretch. 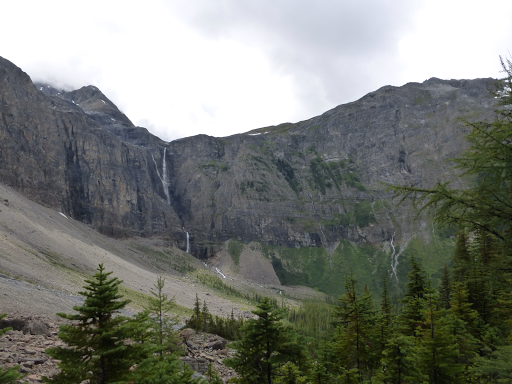 From there, it was down, up, down to our campground at Helmet Falls, the second largest waterfall in Canada. Helmet Falls was visible and audible well before the trail even reached the campground. 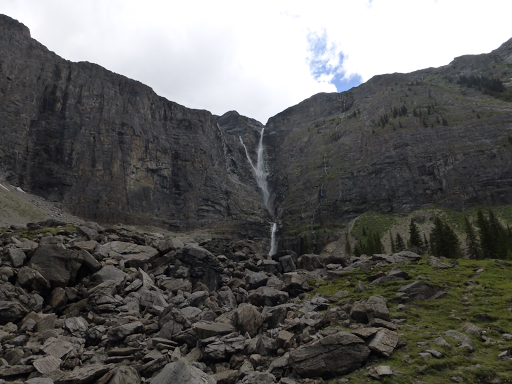 I did a side trail to see the falls closer and it was quite impressive. Again, one of those enormous things that can’t be depicted in a photo. 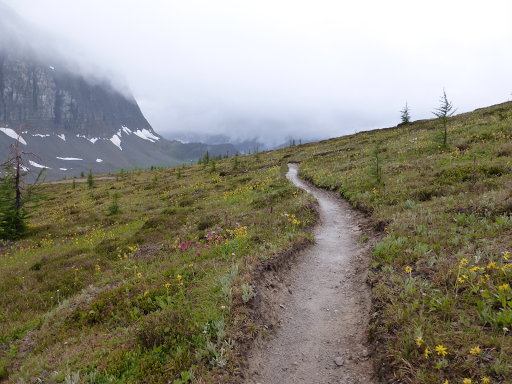 As I was hiking from the side trail to the falls, dark skies returned and a steady rain fell. I was just a few minutes from the campground, but I knew the rain would pass and I didn’t want to set up in the rain. I found a dry log under a protected tree and sat out the rain while I started blogging for the day. My fingers were barely functional because they were so cold. Waiting was a good and bad idea. I was dryer than I would have been had I gone straight to camp, but by the time I stood up to leave, I was shivering and quite chilled. 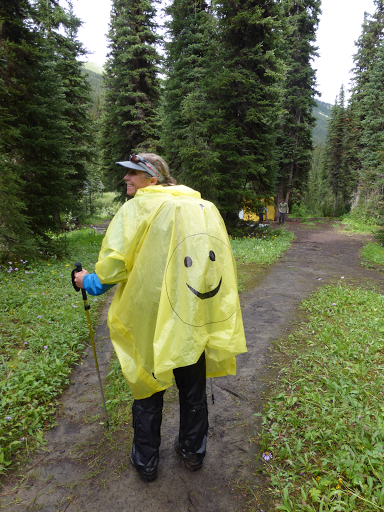 I hiked over to the campground at 5pm, and right when I stopped at a spot, E arrived, smiley face poncho and all. She drew that on there in Banff. What a great idea! She loves that poncho and still uses the umbrella too. All the sites are really crammed together here, so we found a spot a bit removed. It’s right near a steam and is going to be just the white noise I need to sleep well. The sun came out just as we ate dinner and blue skies seem to be in order for tomorrow. Yay! Maybe it will be warm tomorrow! The food area was nicely placed within view of Helmet Falls. I was sooo cold during dinner that I almost couldn’t keep dinner down. Now I’m wearing all my clothes and jackets except my rain pants (muddy) and long sleeved hiking shirt (too wet).